All-on-Four dental implants is a highly affordable solution for anyone wishing to replace their denture with a fixed arch of teeth. Our New York Dental Implants Center only uses a top quality dental implants in NYC center, components are from Straumann, the largest and most advanced dental implant company in the world. Dr. Navid Rahmani is one of the best dental implant specialists in NYC and a top rated NYC dentist accepting patients on Upper East Side, Midtown East office. Before all on four dental implants technique was developed, multiple dental implants were required to secure a complete arch of teeth. This procedure is for anyone who has complete tooth loss in their upper or lower jaw, or in both jaws. This can mean the cost of treatment is beyond the reach of many. Conventional or traditional dental implant treatments also increases the likelihood of requiring a dental bone graft prior to having the implants inserted. With all on 4 dental implants, just four dental implants are required to secure a complete arch of lower teeth, while six dental implants are generally needed to secure a full arch of upper teeth. 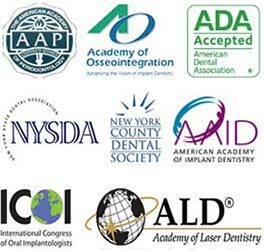 Call our New York implants center if you have questions about the placement of all on four dental implants. What are the Alternatives to All-on-Four? Traditional dental implant surgery (single tooth implants) may be an option, but can be far more costly, particularly if bone grafts are required. Another option may be to use mini dental implants. Bone grafting for dental implants might be required if there isn’t sufficient bone to support your new implant. All on 4 dental implants is highly suitable for anyone who is facing complete tooth loss in their upper or lower jaw, or in both jaws. It is also good for someone currently wearing full dentures and who would prefer to find an alternative and more permanent method of replacing their teeth in Midtown East. An initial consultation with Dr. Navid Rahmani is needed to determine your suitability for All on 4 Dental Implants treatment. He will discuss the procedure with you in greater detail and will need to know your medical history. The next step is to carry out a Cone Beam CT scan, a specialized type of 3-D dental x-ray that will show your jaws, muscles and other facial structures in great detail. This will allow Dr. Rahmani to closely examine the condition of your jaws and to assess the quality and quantity of available bone. Using the CT scan, Dr. Rahmani will be able to accurately plan the position of each implant. A surgical guide is produced prior to the insertion of the dental implants, allowing Dr. Rahmani to accurately place the implants with minimal incisions. Once the implants are in place, they are immediately ‘loaded’ or fitted with your new teeth that will have been before the start of surgery. What is Special About All on 4 Dental Implants? The implants used are a little different, with two implants being placed vertically right at the front of the jaw, while the remaining two implants are placed either side but are tilted backwards at a 45° angle. The advantage in tilting these implants is that it increases their strength and stability. The implants are longer than normal as they are being inserted into a greater amount of bone. This helps to ensure they are held very firmly in place and once the bridge is placed over the top of these implants then they cannot move. 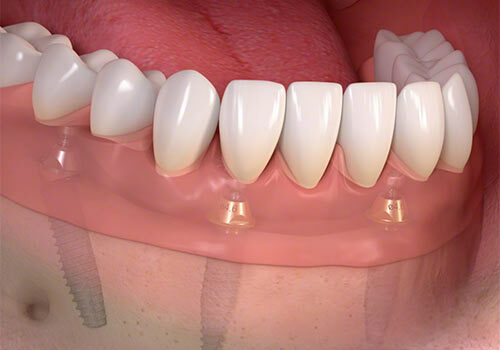 This allows a temporary bridge of teeth to be fixed to the dental implants soon after surgery is completed. What is the Success Rate for All-on-Four? This All on 4 Dental Implants procedure is considered to be one of the most successful treatments for replacing full arches of teeth. The techniques used were originally pioneered in the nineties and have been extensively tried and tested. Clinical research has found All-on-Four offers a good long-term solution for patients who have lost all their natural teeth. All on 4 implants procedure can be a low-risk when properly carried out, but there is always a chance of the implants becoming infected if you fail to keep up with regular dental checkups and cleanings and if you fail to keep your implants meticulously clean. All on 4 is typically much more cost-effective as it only requires four to six dental implants. More traditional procedures often need bone grafts, which will add to the overall cost, but this is not generally necessary with All-on-Four due to the placement of the dental implants to maximize the use of available bone.